Here we go again! Another great Ohio University Trombone Day is coming up soon. I hope you can join us! ​The Ohio University Trombone Day 2017 will be a full day of trombone related activities at the Ohio University School of Music in Athens, Ohio on Sunday, January 29th. Trombone Day will include a group warm-up, master classes, mass trombone choir and a final recital featuring the TWO great guest artists Jeremy Wilson and Dr. David Begnoche. 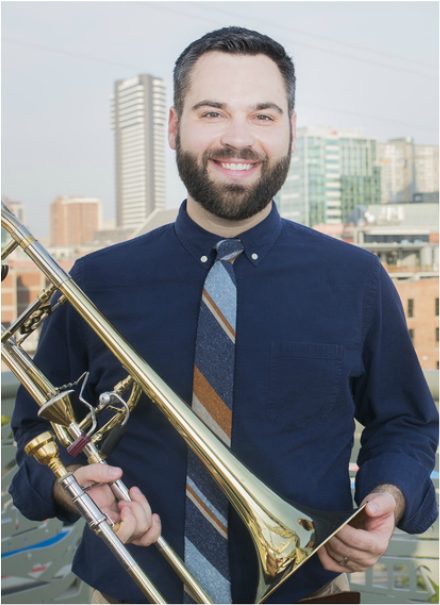 Jeremy Wilson is Associate Professor of Trombone at Vanderbilt University's Blair School of Music. Prior to his appointment at Blair, he was a member of the Vienna Philharmonic Orchestra and its sister organization, the orchestra of the Vienna State Opera. He joined those orchestras at the age of 25 after winning what was his first-ever orchestral audition, and in 2010 became one of just a handful of Americans to have ever been made a full member of the Vienna Philharmonic Society. Wilson holds degrees from the University of Tennessee (BM 2005), where he was a Presser Scholar, and the University of North Texas (MM 2011), where he was a graduate teaching fellow. He studied with Don Hough, Vern Kagarice, Jan Kagarice, Tony Baker and Tom Lundberg. He resides in Franklin, Tennessee, with his wife, Kristi, and their three children. Dr. David Begnoche is Associate Professor of Trombone in the TCU School of Music. Previously on the faculty at the Longy School of Music, Dr. Begnoche has also served as artist-in-residence at Northeastern University and chamber music coach at Harvard University. Dr. Begnoche maintains an active performing career with groups throughout the U.S. and abroad. His extensive professional performing experience includes titled positions with the Joffrey Ballet Orchestra (Chicago), Sarasota Opera (FL), Albany Symphony (NY), Spoleto Festival Orchestra (Italy), Charleston Symphony Orchestra (SC) and AIMS Festival Orchestra (Austria). He has performed with the Boston Symphony Orchestra and has recorded with the Boston Pops under John Williams. In addition to doctoral studies (University of North Texas), Dr. Begnoche holds degrees from Manhattan School of Music (MM) and the New England Conservatory of Music (BM). His principal teachers include Douglas Yeo (Boston Symphony Orchestra), John Swallow (New York Brass Quintet), Steven Norrell (Metropolitan Opera Orchestra), and Jay Friedman (Chicago Symphony Orchestra).